Kumaragupta I (414-455 CE) – As per Bilsad pillar inscription, dated year 96 of the Gupta Era, Chandragupta II begot Kumaragupta I from his queen Dhruvadevi. His earliest date is year 96 of the Gupta Era (415-16 CE) and latest date ,as evident from his coins, is year 136 of the Gupta Era (454-455 CE). J Allan mentions that Kumaragupta came to throne in 413-414 CE which is the last regnal year of Chandragupta II. Allan mentions that his extensive coinage, the distribution of his inscription and of the finding spots of his silver coinage show that he was able to retain his father’s empire comparatively intact. Many gold, silver and copper coins of Kumaragupta I are found. The metal used in the coins suggests that the country was very prosperous. Quality of Kumaragupta I’s coins made R D Banerji to remark that the coins of Kumaragupta I were a class by themselves. Coinage of Kumaragupta is found in many varieties. He introduced many new types of gold coinage. In one of his coin he is seen in act of killing a tiger while in another he is shown killing a lion. He issued a unique coin where he is shown feeding a peacock with legend ‘Mahendra-kumara’ on obverse and reverse carries Kartikeya holding a appear and seated on a peacock. As his name, Kumara, is synonymous with Kartikeya hence he would have issued this coin. Elephant-rider type coins of Kumaragupta I shows him riding on an elephant on obverse. Elephant is also mount of Indra (Mahendra/Sakra). A very rare Asvamedha type of his gold coinage is the only evidence that he celebrated Asvamedha sacrifice. Mahendra, Simha-Mahendra, Simha-Vikrama, Vyaghrabala-Parakrama and Mahendraditya were his popular epithets. 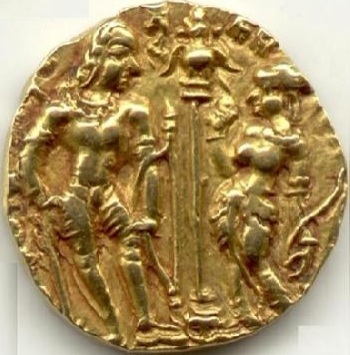 Nalanda clay seal of Kumaragupta III mentions Purugupta as Kumaragupta’s son from his queen Anantadevi. Bihar pillar inscription mentions that Kumaragupta I begot Skandagupta from Anantadevi. Budhagupta would be another son of Kumaragupta I as Huien Tsang mentions Budhagupta as son of Sakraditya. Sakra is another name of Indra or Mahendra hence Sakraditya can be taken another name for Mahendraditya or Kumaragupta I. If we accept the interpretation of D R Bhandarkar on Tumain inscription of Kumaragupta I dated year 116 of Gupta Era, then Kumaragupta I has another son, Ghatotkachagupta. Dandekar suggests that Ghatotkachagupta could be either son or brother of Kumaragupta I. Last Days of Kumaragupta I’s Reign – Was there some issue in the last years of his reign? This complexity is introduced by a specific interpretation of Bhitari pillar inscription of the Gupta king Skandagupta, the successor of Kumaragupta I. This topic has generated quite a fuss among scholars already. There are only two theories, either everything was right till the last day of his reign or there was something wrong during his last days. Let’s see these two theories in detail. Bhitari pillar inscription mentions that the fortunes of the dynasty had sunk to a low and was restored by Skandagupta. In this restoration act he had to spend a night sleeping on bare earth. He conquered Pushyamitras, who had collected all their strength and rose against the Guptas, by placing his left foot on their king as a footstool. No identity of Pushyamitras is given in inscription. The inscription further mentions that he later defeated Mlechchas, whom most scholars have identified with the Huns. However Bhitari pillar inscription of Skandagupta clearly state Huns as his opponents which indicates that the Mlechchas of Junagadh inscription might be referring to Huns only. Allan writes that this inscription suggests that the last years of Kumaragupta I were much troubled. R D Banerji, A N Dandekar agree with this proposition. Banerji states that Kumaragupta I was not a great ruler like his celebrated immediate ancestors. He further mentions that during the last years of Kumaragupta’s rule, the Gupta power declined to a low level. The major decline was observed on its western frontier as Huns were constantly trying to capture that part of land. Huns were a constant threat and a powerful enemy. Skandagupta warded off the first Hun blow during the lifetime of his father, Kumaragupta I. The second blow came during his reign which also he resisted successfully. Later history of his period is not clear however he probably lost his life during a battle with the Huns. Manju-sri-Mulakalpa mentions that the kingdom of Mahendraditya was invaded by the Yavanas (Greeks), Pahlikas and Sakunas, who first fight among themselves and later took possession of Gandhara and countries north of Ganga. Kumaragupta I assumed title of Mahendra so it could be that Mahendraditya mentioned in Manju-sri-Mulakalpa is Kumaragupta I only. However no Greek attack could be possible during fifth century CE, however Huns might be one of the foreign tribes attacking India during those times. A N Dandekar writes that the earlier part of Kumaragupta I’s long rule was by far the most prosperous period in the whole history of the Gupta empire. Manju-sri-mulakalpa describes him not as a weak king but as an excellent and able ruler. He points to Mankuwar stone inscription, dated year 129 of the Gupta Era (448 CE), which refer Maharaja Kumaragupta. Now who this Maharaja Kumaragupta could be, is he same as Maharajadhiraja-Kumaragupta? Dandekar suggests that either referring him as Maharaja was just an error of the scribe or it is an indication that he was probably reduced to the rank of a Maharaja in later years of his reign. O P Singh mentions that we should not forget Kumaragupta I who gave a firm foundation to his successor, Skandagupta, which helped the latter in winning over the enemies. Kumaragupta I did not deal with Huns personally probably due to his old age. And sending a son to tackle rebellions is not a sign of cowardice. He was an able king and administrator which is evident from his rule which extends over fourty years. He mentions that from his Asvamedha type coins we can rule out any possible eclipse at some stage in his reign. However Singh still mentions that the epigraphic evidences suggest some turbulence in the last years of his rule hence it could be that these Asvamedha type coins were issued in middle of his reign. Skandagupta was successful in his conquests however he was not able to restore the prosperity which Indian experienced during Chandragupta II. However, he laid down his life for the cause of Indian Independence, winning for himself highest praise. Govindagupta – A seat found at Vaisali mentions Maharaja Govindagupta, son of Chandragupta II and Dhruvaswamini. He is referred as the governor of Vaisali. D R Bhandarkar mentions that Vaisali was the capital of the Lichchhavis hence it could be that it was the seat to be held by the yuvaraja of the Guptas. Hence Govindagupta would be a yuvaraja, heir-apparent, during his father’s reign. Separation of Empire – Was there a separation of empire after Chandragupta II? O P Singh rules out any separation of the kingdom. Bhandarkar states that it is not clear whether Govindagupta succeeded his father as there are many inscription where Kumaragupta I is shown as a successor of Chandragupta II. He suggests that it could be that Govindagupta is same as Kumaragupta I. A support comes from the coins of Kumaragupta I where legend ‘ku’ and ‘go’ are found on obverse. However there are no coins which can be assigned with conformity to Govindagupta. J Allan states that Govindagupta could not be same as Kumaragupta I as the former is only mentioned as maharaja however he could be a younger brother of Kumaragupta I. As no inscription is found for Govindagupta hence it may be assumed that if he had ruled then it would be for a very short period, may be a year. I feel that as no other inscription and any coin of Govindagupta is found, we need not try to fit him in the Gupta chronology. It is very much possible that he held governor position during his father’s rule and the position continued when Kumaragupta I ascended the throne. Skandagupta (455-467 CE) – Bhitari pillar inscription, dated in year 136 of the Gupta Era (454-455 CE), mentions that Skandagupta succeeded his father Kumaragupta I. Most important inscription of his reign is his Bhitari pillar inscription which mentions about an installation of a Shiva linga by him. R D Banerji states that his latest date is year 148 of Gupta Era (467-8 CE) as found on his silver coins. J Allan mentions that Skandagupta died in about 480 CE leaving no heir. Junagadh inscription, dated in year 138 of the Gupta Era (457-458 CE), mentions that Skandagupta’s fame is proclaimed in the country of Mlecchas who were his enemies as he broke their pride. It also mentions that Skandagupta’s father is dead and he overthrew his enemies and made the whole earth subject to himself. Skandagupta came back to his capital after installing Parnadatta as a governor of Saurashtra. Dandekar mentions that Skandagupta’s extensice coinage indicates that that he had maintained supremacy in his western dominion. His issued golden coins but these are found very few in numbers. He assumed titles like Kramaditya and Vikramaditya as evident from his coins. No reference of his wife or children is found hence it is assumed that he dies leaving no heir. However if we accept the restoration of Bihar pillar inscription of Budhagupta then it appears that Skandagupta was the son of Kumaragupta I through his queen Anantadevi and Budhagupta was the son of Skandagupta through his queen Chandradevi. Fight for Restoration – As discussed above, it is evident that Skandagupta fought some hard battles to restore the lost glory of the Guptas. Who were these enemies with whom Skandagupta has to fight? Bhitari inscription talks about Pusyamitras and Mlechchas who were defeated by Skandagupta. Who were these Pushyamitras? J F Fleet suggests if these are same as the Puspamitras of Vishnu Purana then these must be located near Narmada whereas V A Smith places them in north. O P Singh mentions that rise of Pushyamitras was probably encouraged by the independence gained by Govindagupta in Western Malva. B P Sinha suggests that they might be encouraged by the fight of succession between the sons of Kumaragupta I.
R K Mookerji mentions Vakataka king Narendrasena lost some territories to Samudragupta hence his son, Prithivishena II was eager to get back his territories from the Guptas. Balghat copper-plate of Prithivishena II mentions that he have embraced Kosala, Mekala and Malwa while he undertook the task of raising and restoring fortunes of his family. Hence it is possible that Skandagupta met Vakatakas with Pushyamitras as his enemies. D R Bhandarkar mentions that the Nagas rose in rebellion after the demise of Kumaragupta I. Ghatotkachagupta was killed in handling Nagas and Skandagupta fled. This is why he had to sleep on earth. However he came back triumphantly defeating the Nagas. Junagadh inscription mentions Nagas as rebels however Bhitari inscription mentions Pushyamitra. Bhandarkar mentions that it could be that Nagas invited the Huns against the Guptas. Fratricidal War – Few scholars like K P Jaiswal, R C Majumdar, D C Ganguly mention that the enemies of the Junagadh inscription refer to some fratricidal war which broke out among the sons of Kumaragupta I after his demise. Majumdar states that emission of Skandagupta’s mother from Bhitari Pillar Inscription suggests that he was not a son of the chief queen hence he has no claim on the throne. D C Ganguly states that the Junagadh inscription suggests that the goddess of fortune selected Skandagupta as her husband, having discarded all other sons of the deceased sovereign. Hence it is obvious that Skandagupta secured the throne through his own prowess instead of natural inheritance. He suggests that Skandagupta was away on front when Kumaragupta I suddenly passed away, Purugupta being the eldest son sat on throne. Skandagupta when came back, snatched the throne with his own prowess. However R K Mookerji, D R Bhandarkar, D N Dandekar disagree with this as the enemies mentioned in the inscription refer to external enemies but not internal. Dandekar mentions the the coins of Purugupta and his sons, Narasimhagupta and Kumaragupta II, were confined to West Bengal, Bihar and eastern districts of Uttar Pradesh which suggests that their kingdom was limited. In this circumstance, it would be logical to assume that Purugupta succeeded Skandagupta as Skandagupta ruled over a vast kingdom. Also the last date of Kumaragupta I is year 136 of the Gupta Era and Junagadh inscription of Skandagupta is also of the same year, in this case how to place Purugupta in between these two Gupta monarchs. Last Years of Skandagupta – Last years of Skandagupta are in drak due to scarcity of historical data. Allan mentions that the currency issued by him was debased significantly in his later years which suggests that the royal treasury was not adequate enough to support the earlier quality of metal. This degradation in quality suggests some turbulence during those days. However B P Sinha proves with chemical analysis that there is no debasing in currencies during later times of Skandagupta. R D Banerji mentions that Skandagupta failed miserably in grasping the situation and resisting Huns. He permitted them entering into India and settling down in Punjab without giving any resistance. He was late in his counter attack and this proved disastrous for him. Once Huns are inside India they kept knocking on Gupta borders and did not leave the Gupta emperor in peace. He repulsed the Huns however his defense went on weakening. His resistance collapsed ultimately and he probably lost his life in struggle. But is labeling Skandagupta as a careless and lacking foresightedness without strong proofs correct? He was the only Gupta king who resisted the Huns and that also he did successfully. B P Sinha mentions that the Huns entered India after 484 CE as they were busy with the Persians. If it is true then how they allow one part of army to handle India weakening their Persian front? O P Singh suggests that Huns after defeat from Skandagupta moved to Persia and did not return back to India till the demise of Skandagupta. R N Dandekar mentions that Vakataka revolted against the Gupta supremacy and asserted their independence in the last days of Skandagupta. They took the opportunity of Skandagupta being busy with Huns and Pusyamitras for their revolt.